A 24-year-old, fifth-generation North Carolina beekeeper has built a different kind of startup. No millennials writing code. Just thousands of bees, making honey and money in downtown Durham. A 24-year-old North Carolina woman has built a successful startup. Her company doesn’t have hordes of millennials writing code. Instead, it has thousands and thousands of bees, making honey and money on the rooftops of old tobacco warehouses. Durham, North Carolina, has secrets. These secrets sit on the roofs of downtown Durham’s old tobacco warehouses — now restaurants, lofts, and tech startups. The secrets buzz through fields behind the largest research park in the country, through community gardens and schoolyards. These secrets are beehives — sticky with honey, heavy with thousands of workers toiling to please their queens — hidden on rooftops and out-of-the-way spots all over town. Spring has come to North Carolina. Redbud trees paint the horizon in strokes of deep magenta, dogwoods burst with white and pink, and the honeysuckle eagerly emits its thick fragrance. Amid this abundance, thousands of honeybees emerge to begin their annual forage. They get to work, flying three or four miles across town to pollinate lilacs in someone’s garden or tulip poplars in a nearby park, and they return to do their mysterious dances in their colorful rooftop hives, in the one painted with rabbits, say, or with the logo of the Bull Durham Beer Company, or the two whose vibrant triangles represent Research Triangle Park. There are more than 100 of these hives — each with thousands of bees — in Durham and nearby Raleigh and Chapel Hill. They belong to Bee Downtown, an urban beekeeping startup founded in 2015 by Leigh-Kathryn Bonner, right after she graduated from North Carolina State University. At 24, she’s young in an old-school industry dominated by an older generation of men. As a woman, she’s not your typical beekeeper, either. But Bee Downtown is thriving and growing under her watchful eye and her careful hands, which move expertly in and out of the hives. 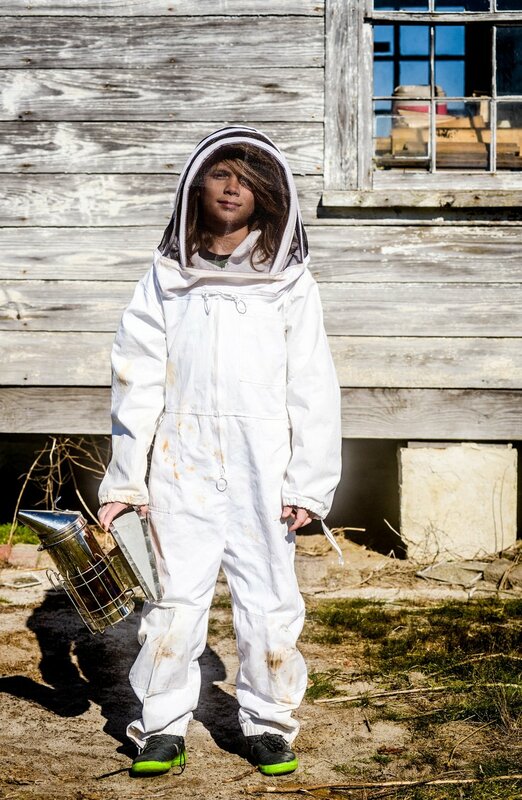 She may be young, but she draws on a deep well of knowledge: She’s the fifth generation in a family of North Carolina beekeepers. Honey runs in her blood. And to Leigh-Kathryn, beekeeping has always been a vital component of the way we live and the way we eat, whether it’s in the rural farmlands where her family’s hives are or in the trendy downtowns of revitalized Southern cities. “I sound my barbaric yawp over the roofs of the world,” Walt Whitman wrote, encouraging us loudly and enthusiastically to express everything within ourselves. Standing on the roofs of downtown Durham as bees thrum around her, making plans to expand her hives across the South and around the world, Leigh-Kathryn Bonner is sounding a very impressive yawp. Leigh-Kathryn didn’t always want to be a beekeeper. She grew up in Raleigh, where her dad worked as an area vice president of Staples, and her mom, who worked in agriculture sales, quit her job to raise Leigh-Kathryn and her sister. Summers were spent at Country Square Ranch, the family’s farm in Farmville, North Carolina, an agrarian town of about 4,800 people about an hour east of Raleigh. Leigh-Kathryn’s mother grew up on the farm with three brothers. (“My grandpa called her the rose among the thorns,” Leigh-Kathryn says.) They worked in the tobacco fields that, along with beef cattle, brought in the family’s primary income. Bees were there, too, already — several hives kept first as a hobby by Leigh-Kathryn’s great-great-grandfather and then in earnest for honey by her grandfather, Harold Flanagan, the farm’s current patriarch. Harold’s son and Leigh-Kathryn’s uncle, Jerry Flanagan, who bears the prestigious title of master beekeeper, traded tobacco farming in for around 700 hives, which Flanagan now maintains on the farm for honey production and pollination services he provides across the state. Once in college, she started to think seriously about beekeeping, but even then, she took a while to come around. She took NC State’s famed “Bees and Beekeeping” course because she figured her experiences at the farm would guarantee her an easy A. (Her grandfather and uncle had also taken this same class when they attended NC State, and Harold and Leigh-Kathryn had the same professor, generations apart.) But her good grade came with an unexpected perk: a newfound love of beekeeping, which she threw herself into wholeheartedly. She began working the family’s hives with her grandfather and uncle and continued studying apiculture. Her junior year, she took an internship at American Tobacco Campus, a complex of former Lucky Strike and Bull Durham cigarette factories that’s now a vibrant fixture of downtown Durham, with restaurants, startups, galleries, offices, and community gathering space. She worked for American Underground, an entrepreneurial startup hub there, but she hadn’t abandoned the bees. In fact, she wanted to start her own hive, but her landlord wouldn’t let her keep one in her Raleigh apartment. So, she asked Michael Goodmon, a family friend and vice president of real estate for the Campus, if he’d let her put a hive on the complex’s roof. Incidentally, when Leigh-Kathryn’s family used to grow tobacco, they sold their crops to the cigarette companies at American Tobacco Campus. Now, generations later and a far cry from tobacco, those same brick buildings house Leigh-Kathryn’s own contribution to the family industry. Goodmon connected Leigh-Kathryn with Burt’s Bees, whose world headquarters are at American Tobacco Campus. Word spread about the strange hive on the roof, and soon other companies were getting in touch to let her know they, too, wanted in on the project — they, too, wanted hives. Bee Downtown gives local businesses the opportunity to sponsor hives, which can be kept at the businesses themselves or in community apiaries. Leigh-Kathryn maintains the hives, and the businesses get to make a sustainable, long-term impact on the environment by giving thousands of bees a home. They also get to keep the honey. In June 2015, the summer after she graduated, Leigh-Kathryn pitched her parents on the idea (complete with a PowerPoint presentation in their living room), and they agreed to fund her living expenses for a year to see if she could get the business off the ground. She did. Now, nearly two years later, there are more than 100 hives sponsored by around 50 different companies in the area. The company also hired a second full-time employee, Justin Maness, to help maintain the hives, help the business grow, and expand into a more scalable business model. Justin came to Bee Downtown after a job researching the effects of pesticides on bees. Like Leigh-Kathryn, he had also gone to NC State and fallen in love with apiculture after taking the “Bees and Beekeeping” course, but they never crossed paths there. He reached out to her after Bee Downtown was up and running and they collaborated on a few side projects, after which she hired him to be Bee Downtown’s lead beekeeper. Bee Downtown emphasizes education and spreading awareness about bees and their role in our environment. And there’s good reason to want that. Honeybees are the world’s No. 1 pollinator, pollinating 80 percent of Earth’s plants. Conventional wisdom translates that number into about every third bite of food we eat. That means bees contribute more than $153 billion to the world’s economy every year. In North Carolina, honeybees are critical to the production of cucumbers, apples, and blueberries, which North Carolina produces in large quantities for the entire country. In other words, honeybees are vital to the state’s and the world’s agriculture, but for the past couple of decades, the bee population has plummeted. In the last year alone, the United States lost 44 percent of its honeybee population, the biggest decrease in 10 years. The South, with its warm climates and plentiful flowering plants, is a natural home for honeybees, and it was hit the hardest. And while much of the population has re-stabilized since, it’s done so through artificial colony splitting, which drastically reduces the health, quality, and genetic diversity of the bees, decreasing their lifespans and output. The widespread honeybee crisis results from a combination of factors, according to Rick Coor, president of the North Carolina Beekeepers Association, the largest in the nation. The Varroa mite is the honeybee’s deadliest natural enemy, and has been killing the insects since it was introduced to the United States in 1988. Another important factor is deforestation, which has run rampant to make room for cities and cornfields. It destroys bees’ natural habitats and their most plentiful pollen sources in a forest’s lower canopy — the tulip poplar, holly, gallberry, red maple, and basswood. Finally, pesticides, thought to be behind much of the colony collapse epidemic, eliminate weeds that bees need for forage and introduce toxins into their environment. But as humans take away, humans can also, to some extent, give back. And by familiarizing North Carolinians with the honeybees’ plight and providing thousands of bees with new homes in urban environments, Leigh-Kathryn, Justin, and the rest of the Bee Downtown community are doing their small part. Bee Downtown promotes healthy and sustainable urban beekeeping by buying strong bees with strong lineages from Leigh-Kathryn’s uncle. Bees can fly up to four miles in search of food, and they’re offered a larger diversity of plants and flowers in an urban environment than they are in rural areas. In general, the popularity of urban beekeeping is on the rise, and that’s encouraging. In North Carolina alone, beekeeping has increased by 470 percent in the last 15 years, partly because of the trend of eating local and living off the land. People who grow their own vegetables in their backyards or raise their own chickens might also be interested in keeping a couple of hives. But Leigh-Kathryn says more than half of hobbyist beekeepers lose their bees after the first or second year, largely due to a lack of accurate information about how to keep a healthy hive. Beekeepers’ associations can help, but not many exist in big cities, and while the internet can be useful, it also provides a wealth of misinformation. Ultimately, Bee Downtown aims to provide urban bees with stable living conditions for long periods of time. In the long run, these healthy bees can move into other parts of North Carolina order to help restore the strength and quality of rural populations, too. Leigh-Kathryn hopes the process will perpetuate itself: As more and more people see bees and hives in their cities, the more they’ll ask questions and come to understand bees’ critical contributions. That’s already begun on a small scale. When Michael Goodmon put that first Bee Downtown hive on the roof of the American Tobacco Campus, not only was it a marketing tool, but it also served a bigger purpose. “We started thinking a little more about our planting patterns and whether we’re planting bee-friendly plants,” Goodmon says. Other businesses are also invested in helping bees survive. “The outdoors isn’t going to be the same if we don't have bees to do the work they do,” says Philip Freeman, the owner of Murphy’s Naturals, a Raleigh-based company that makes environmentally friendly mosquito repellents and encourages customers to enjoy life outdoors. Freeman bought three Bee Downtown hives for Murphy’s Naturals’ roof and plans to add two more this spring. He also hopes to use beeswax from the hives in his company’s mosquito-repellent candles, in essence allowing one local insect to help another. Honeygirl Meadery is another local sponsor with a hive in Durham. Diane Currier, the owner and mead maker, relies on honeybees and beekeepers to keep her own business afloat, and she’s eager to help spread the word about the importance of bees in any way possible. Jerry Flanagan’s cell phone rings off the hook. As one of the best beekeepers in North Carolina, others call him for advice, looking to buy equipment, or to ask him questions about their own hives. During a cold snap in March, he’s at Country Square Ranch in Farmville checking on the hives, hoping the bees haven’t gotten too confused by the weather. He answers every call. “I keep telling him he needs to start charging for consulting, but he’s never going to do that,” Leigh-Kathryn says, laughing. “He’s a mentor for more folk around here than you can shake a stick at,” her grandfather and Jerry's father, Harold, chimes in. Leigh-Kathryn will tell you her Uncle Jerry taught her everything she knows, and now he gathers three of her cousins together — Arch, 14, Jack, 13, and Sam, 10 — and another cousin’s son, Jase, 3, four boys in bee suits who look like astronauts dropped into the landscape. He stuffs straw and wood chips into a bee smoker, a tin burner with an attached bellows that releases smoke into a hive. The smoke calms the bees by masking the alarm pheromones they release when their hive opens. Jerry’s a commanding presence — a large man with a big, white beard, a giant among the bee boxes and their tiny residents. Only one of his queens has a name — Miss T — but he’s familiar with all of the bees and delicate with them, too. He takes great care to explain the nuances of the trade to his nephews and grandson, guiding them every step of the way. He looks around at the expectant faces. “Yes, sir,” Jack responds, serious and respectful. He knows he’s watching something powerful. They all do. Sam missed soccer practice to come to family bee day. He wants to work at Bee Downtown when he grows up. Jack likes the astonishing idea that, as a beekeeper, you’re working with thousands of insects at a time. And Arch has shown an early propensity for queen rearing, an industry all its own. Their mom boasts that they learn more in a summer tending hives with Jerry than in three years at school. Most of Country Square Ranch’s hives have already been trucked out to North Carolina’s blueberry farms for the spring, where they’ll spend a few weeks pollinating the plants. Because wild bees have all but died out, farmers throughout the country rely on professional beekeepers to bring bees to them. That’s the biggest part of the rural apiculture industry now. Jerry also sells honey and beekeeping equipment to stay afloat and raises cattle on the farm. Both Jerry and Harold say they’re surprised Leigh-Kathryn became a beekeeper — and an urban one at that. In fact, Harold laughs out loud thinking about it. But they’re both very proud and happy Bee Downtown is doing well. “She’s come up with a really novel idea and is really getting people aware of the need for bees,” Jerry says. But he waves off talking about Leigh-Kathryn — he knows he’s done good work teaching her, and he sees her talents bearing fruit. Instead, he turns his attention to the bees — that’s why he’s here, after all — and to the boys who need his mentorship now. He asks Sam to smoke a hive as tall as he is. “All right, do they have a queen?” he asks, and several generations of Flanagans bow their heads to peer into the box. This time last year, Leigh-Kathryn installed 19 new hives around the Raleigh-Durham-Chapel Hill triangle to bring her total to 31. In a year, Bee Downtown’s business has more than tripled, and Leigh-Kathryn hopes to expand Bee Downtown into five new cities in North Carolina and surrounding states. After that, the rest of the world. But her ambitions will not be realized easily. For one, being a female CEO of a startup already puts her in a minority. And being a young woman in an old-school, male-dominated field comes with its own set of pitfalls. Men see her out in the field to collect a swarm and tell her to wait until a beekeeper arrives. Men tell her she shouldn’t climb ladders or carry equipment. Moreover, scaling and expanding the company means she’s had to learn how to run a business on the fly, and she spends more time in an office than with her hives, which has been a difficult transition. But Leigh-Kathryn makes it work, and it pays off, especially when she hears from people who find one of her hives, sit down next to it, and just listen to the hum, absorbing the beauty and complexity of the bees. That makes her happiest — being able to share her love for bees and all they do for us and letting others in on that vital secret. “She sets a standard that amazes the rest of us, I’ll put it that way,” says Coor of the North Carolina Beekeepers Association. And even though Leigh-Kathryn has succeeded in bringing honeybees back to her city, encouraging a new generation of beekeepers, teaching communities about the work bees do, and developing a model that makes beekeeping financially sustainable, she’ll be the first to note that she didn’t do it alone.